The Header/Footer tab in the QuickBooks 2013 Report window controls what header and footer information appears on your report. You use the Show Header Information check boxes to control the report header. For example, if you want your company name to appear at the top of the report, select the Company Name check box. And if you want to change the company name that appears at the top of the report, edit the contents of the company name text box. The other Show Header Information check boxes work in the same way. For example, to remove the report title from the report, deselect the Report Title check box. To use a different report title, edit the contents of the Report Title text box. 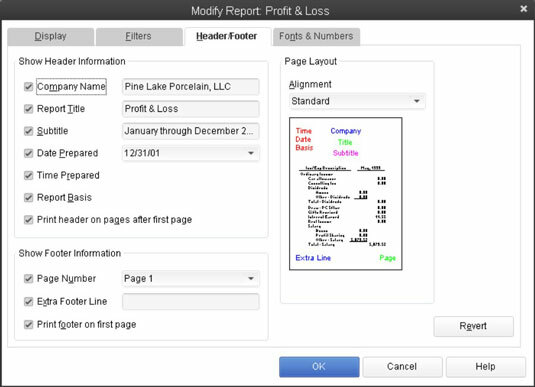 Use the Page Layout area — this provides a single Alignment drop-down list — to choose a layout for your report. By default, QuickBooks uses a standard alignment. You can also choose a left alignment, right alignment, or a centered alignment. QuickBooks shows you how the report layout changes depending on the alignment selected. As is the case with the other tabs of the Modify Report dialog box, you can click the Revert button to change back to the default header/footer settings.